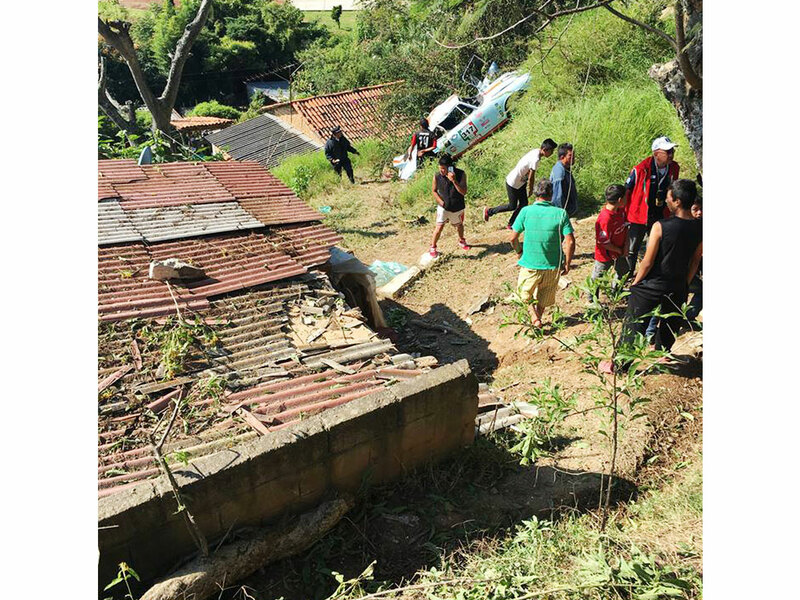 A harrowing tale of flying off a 300-foot cliff, rolling four times, demolishing a tree and part of a house—and walking away. This year, I answered the call of La Carrera Panamerica. 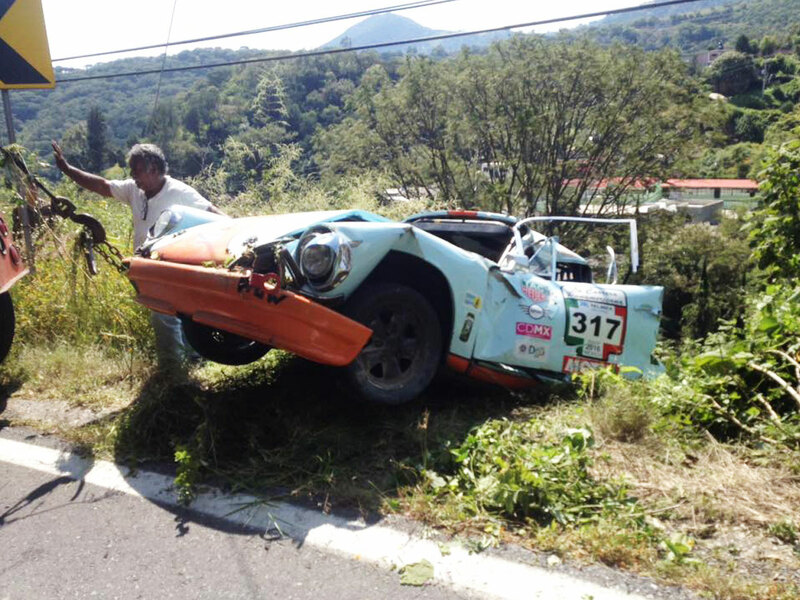 For the uninitiated, the Pan-Am is a seven day race where vintage race cars tear through 2,000 miles of Mexican city streets and backcountry. The race began in 1950, as an initiative of the Mexican government to showcase a then-new system of roads, called the Pan-American Highway. In 1955, the PR effort was deemed a success and the race was shuttered, only to be revived in 1988 by a group of auto enthusiasts. 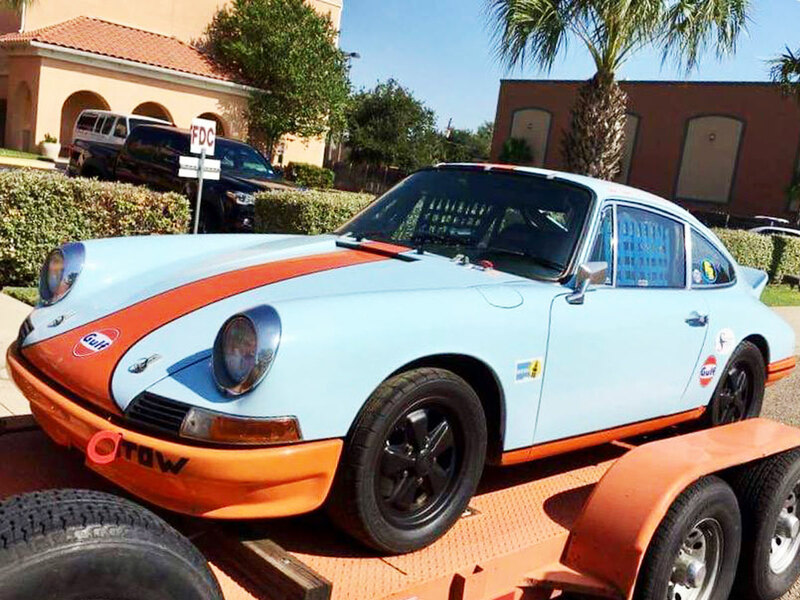 Running such an historical event was a bucket list item, and I bought the perfect car to see my dream to fruition: a 1968 Porsche 911. Little did I know, this car would soon save my life. I knew this 911 was the one after heading to Arizona and running it on track three times. I’d gone to Mexico City to see another possible option, but this 911 felt perfect. It had run in the Pan-Am three times before, even getting a podium once. It had the bonus of being fully compliant with the regulations of the Pan-Am and we didn’t want to have any technical issues when entering. My co-driver, racecar driver Buddy Rice, came out to test it and declared it great. So I plunked down about $100,000 and got the car on a trailer to my shop in Texas. Buddy, who won the 2004 Indianapolis 500 and the 2009 24 Hours of Daytona, really knows racing. We met after we both invested in Gas Monkey Energy. I’ve raced prototypes in the 24 Hours of Daytona and just completed the Petit Le Mans in Atlanta, but my day job as the owner of mortgage company Southwest Funding means I don’t drive as much as I’d like to. Neither of us have raced with a navigator, which the Pan-Am requires. The navigator has a route book that comes directly from organizers, with detailed maps and corner instructions, and each turn listed by degree of difficulty. We hired a professional co-driver to navigate, a fellow named Ben Slocum out of Michigan, who’d completed more than 100 races, from Dakar to the Baja. Buddy and I figured that with Ben calling the shots, we’d be fine to jump in with no training and figure it out as we went. Buddy was behind the wheel for qualifying and we ended up second in our class and 16th out of 62 cars, overall. We were thrilled, especially since the top ten or so had more than 700 horsepower and we were keeping up in a 911 with an early ‘70s engine, tuned to about 200 ponies. Not too shabby, right? The next day, the race began. The daily routes of the Pan-Am are divided into two stages: transit and speed. Transit stages are between two towns, run on regular highways, with regular traffic all around. Speed stages are usually on mountain passes, where the roads have been closed to traffic, and each car has to start at a target time. Warnings are issued about road conditions, speed bumps and more, but there’s always the possibility of a surprise awaiting you around the next blind bend. We studied the route and the stages hard, because we had to get them down quick. The transit stages are the most difficult, because you’re flat-out in full traffic. But they’re also the most exhilarating. Buddy drove the first day, with Ben calling. They had great synergy, really cranking. There was only one problem, which we quickly discovered. The Pan-Am notes about turns, and degree of difficulties, weren’t consistent, or even right. They were the organizer’s arbitrary interpretation of the road. It’s disconcerting to scream into blind corners with a sheer cliff on the side relying on someone else’s thoughts, so a number of teams had come down early and run the course to get their own notes. We didn’t have that luxury, so we were stuck with their questionable handout. The first day went well, though, and we finished second in our class and 10th overall. Day two came, and I was at the wheel. I drove the first two stages conservatively, building confidence with each passing mile. I finished the day still second in class, but I lost five spots, overall, and left us sitting in 15th. Most of the day’s stages were uphill, and the cars with triple our horsepower were killing me, but our car was still performing well and reliably. That night, Buddy suggested we double up wheel time to keep the good momentum going. That meant I’d be back behind the wheel for day three. And that’s when bad things started happening. You have a very short period of time to get through the transit stages to the start of a speed stage. Miss your start time, and you’re heavily penalized. Our GPS unit wasn’t doing great, and Ben and I got lost—along with eight other racers—during the first transit sprint. 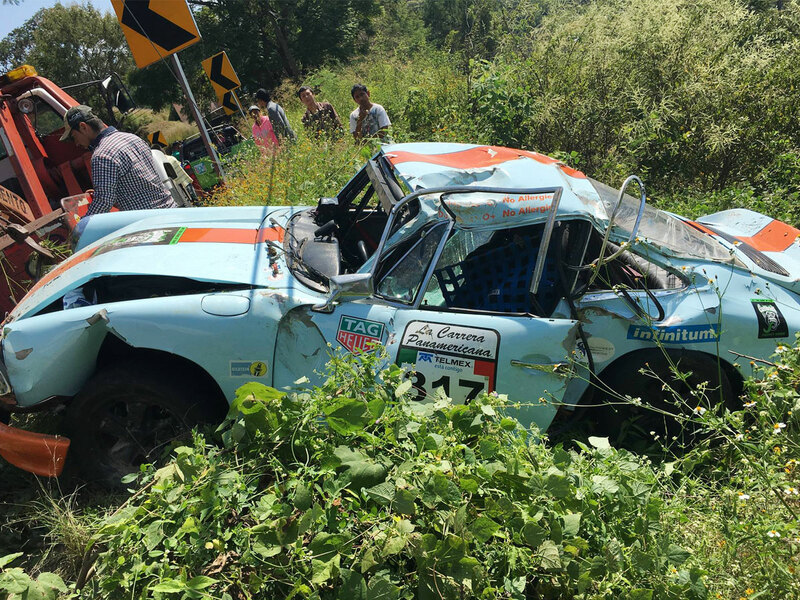 We rolled in hard to the first speed stage of the day, arriving just as we were scheduled to start the next stage. My adrenaline was through the roof, since I was just doing 140 miles an hour through traffic for 45 minutes. In hindsight, I probably went into the speed stage too aggressively, but I was proud we made it without penalty. In that split second, that one when you know a huge crash is imminent and everything slows down, I had time to make one final move. I saw a huge mound of dirt directly ahead of us. If we hit that, we’d launch into the air, Dukes of Hazzard-style, right off the side of the hill. So I worked the steering as hard as possible to avoid that ramp. I managed, barely, and we catapulted from the road and began to barrel roll down the treacherous side of the hill. After the first flip, all the glass in the car shattered. I saw a tree coming at us and, in an second, we hit it and flipped around again. After another roll, we slammed into a cistern on top of a house, demolishing it and passing over most of the house, and tumbled down again. And again. All I saw was green and blue, as the blurry view alternated between grass, trees and sky. After the fourth roll, we came to rest on a mound with a boulder under it. Shockingly, I was, as was he. We shut the power off and climbed out through the space where the windshield used to be. The first thing I saw was a chicken walking by, clucking. The Porsche was destroyed, mangled and twisted beyond repair. I gazed up at the top of the hill, some 300 feet above us, to see a stream of bystanders rushing down. The tree we’d slammed through was obliterated, and this wasn’t some young sapling; there were branches some 10-inches thick. The house we’d plowed over was missing a corner piece and some of the gutters, their water system scattered around in pieces. Our windshield was some 100 feet uphill to the left, 50 feet above it and to the right was our GPS. We walked back, collecting the bits of our broken car and making a pile. The Pan-Am may not nail their turn notes, but they do get a few things right, and one of them is having a guy who travels along with you to help you should you get into trouble. Our guy stepped in to handle the payment negotiations with the family whose house I just rolled over. He came back and said I should give them $250. I gladly handed over the cash. I would’ve paid more. Eventually, a tow truck with a long winch arrived, and they started to drag the demolished 911 back up the hill. It took some time and while the crew was working, a small mass of bystanders had formed a throng on the side of the road where we’d gone off. They were so enthralled with watching our car slowly bump its way back up the hill, they didn’t notice the speeding traffic on the road. Soon, a family with a baby was struck. Then a taxi cab slammed into another car, totaling both. It seemed like every few minutes, there was another serious accident behind us. Ben and I were lucky to walk away from the incident unscathed. An hour later, another racer on that very stretch of road wasn’t so fortunate. 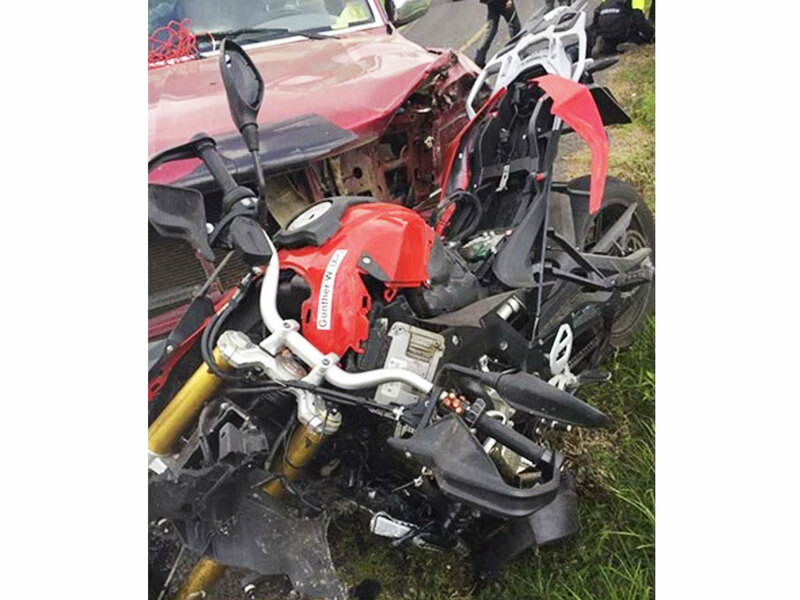 Organizers had let some motorcycles participate this year and, despite the closed road, a pickup truck had pulled out of a driveway right when rider Gunther Wilfinger came around the bend. They hit head on and Gunther died instantly. Some of our crew had eaten lunch with Gunther hours before. News of his passing was tremendously sad. 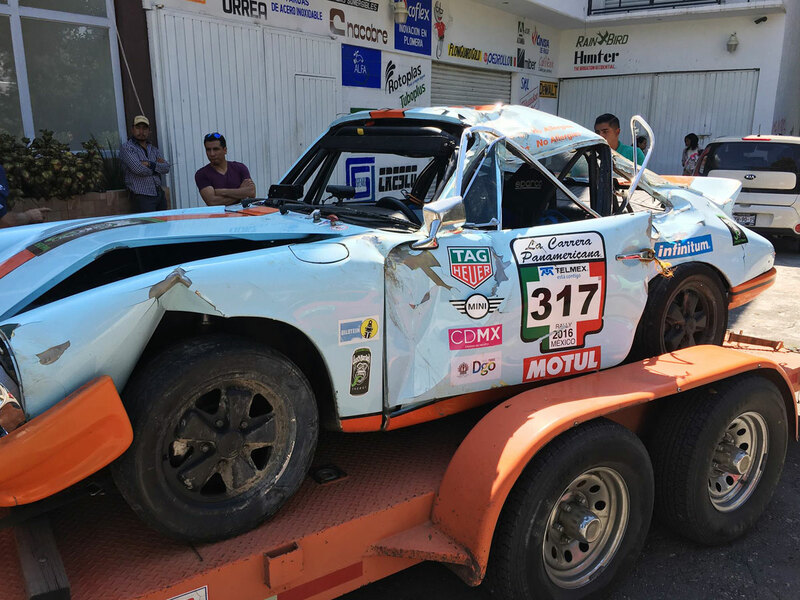 I flew out of Mexico, and the mangled carcass of the 911 is currently on a truck headed back to my shop in Texas. I’d guess I spent about $130,000 on the Pan-Am race, and Buddy and the rest of our crew, Jay Cottrell and Andres Huerta, had given priceless blood, sweat and tears. Was it worth it? It was a good experience despite not being the outcome I wanted. You always want your bucket list experiences to end on a positive note. I’m a Porsche guy and to see a Porsche in this condition is heartbreaking, but I do want to come back and run this race again. We will rebuild and we will come back next year. I’m not ready to give up yet.